!! Canadian PM Stephen Harper loves kittens !! 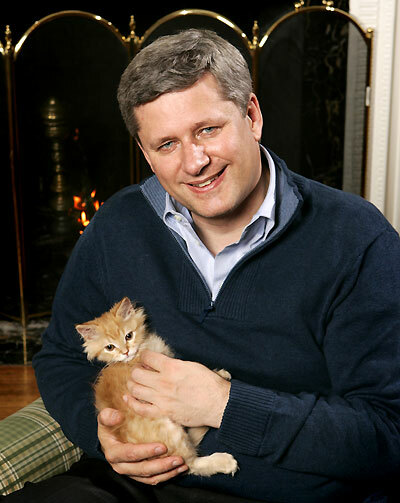 Trying to soften his image a bit, blue-eyed Conservative monster-of-a-Canadian-prime-minister Stephen Harper has taken to having photo ops with kittens and endorsing the Humane Society. 6 Comments on "Canadian PM Stephen Harper loves kittens"
:):( why do people think you eat babys??? It’s already illegal in Canada to kill seal pups. He may love his cat, but he is reponsible for the canadian seal slaughter and the humane society in this country has had to go so far as to encourage boycotts of canadian products to get him to outlaw killing those babies – and he still has not done it!! He’s about to eat the kitten.